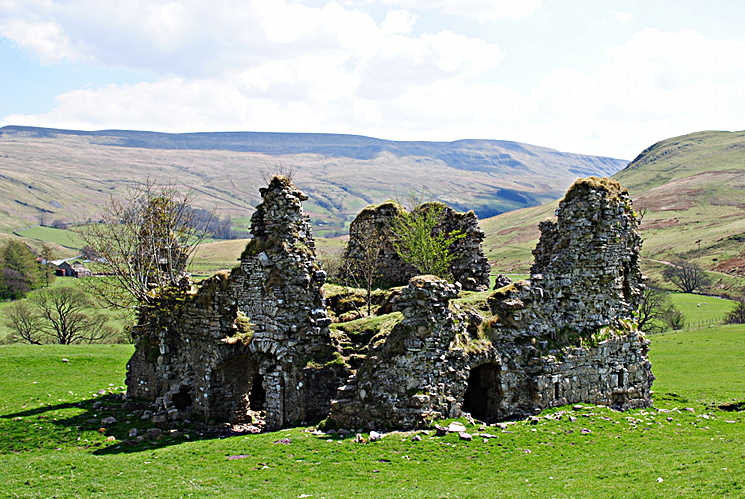 Mention the two words Mallerstang and Castle, and the majority of people who have visited the area will immediately think of Pendragon Castle, one of the favourite places of the great Lady Anne Clifford. 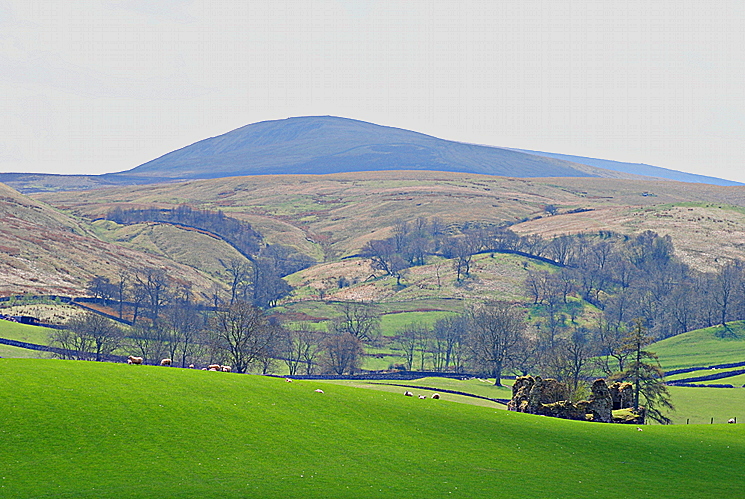 Driving, cycling or walking up to the Mallerstang valley from Kirkby Stephen and Nateby, however, long before we reach Pendragon we pass Lammerside Castle to the right. 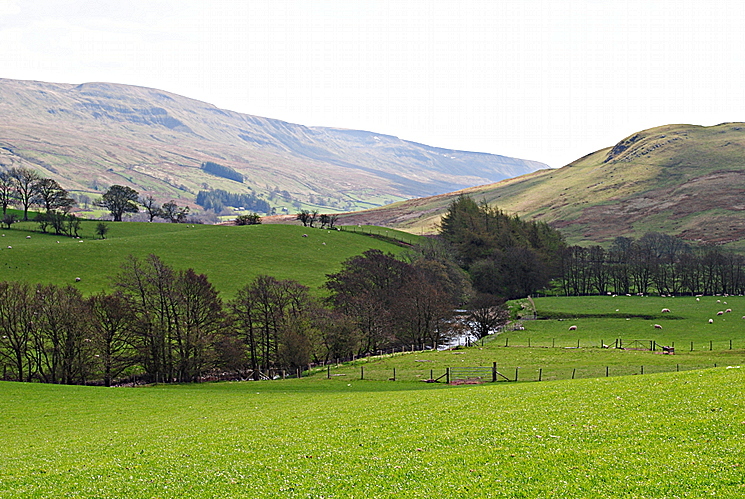 The first photo here shows the ancient Mallerstang boundary stone against the wall just beyond the cattle grid at the entrance to the expanse of level ground by the river, known as Birkett Bottom. 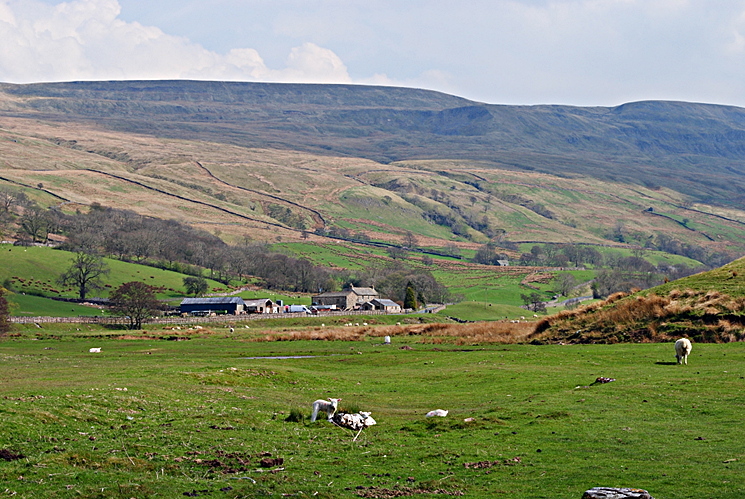 From here, looking up the valley we get a good view of Mallerstang Edge, rising to around 650 metres, beyond the farm buildings at Dalefoot. To the right, just out of the picture, Birkett Common reaches just over 350 metres, or about 450 feet above the river level. This is a rare patch of flat land on the east bank of the stream. If you walk a little onto the level grassy area and turn around you see in the distance, beyond the farm buildings, what might at first seem like a broken down shepherd’s hut. Not one bit of it! This is what Pevsner describes as a 14th century pele tower, but how much further back does it go into the mists of ancient time? This is Lammerside Castle. What isn’t obvious on this photo is that the river is between you and the castle. To reach it we must first return almost to Nateby, and take the Bridle path to Mire Close Bridge, go over the bridge and follow the waymarks to the left. It’s not always totally clear where the path actually lies. By keeping close to the fence that follows close to the river we come eventually to a gate and using only the OS map we become more confused as this gate does not carry a waymark sign. If you’re following a walking guide such as Ron Scholes’s Walking in Eden you’ll be less confused because more detailed instruction is given than can fit on an OS map. Confused or not, the view from here is glorious. The following shot was taken from the gate. With the Eden down below, Birket Common in front and to the right, with the tops of Mallerstang behind and to the left, this to my mind is one of the best view points for miles around. But where is the castle? Turning about ninety degrees to the right, it’s there in the distance, at times in the shade almost invisible against the pattern of woodland on the more distant fellside. Here’s the same view through a longer lens. So on we go, and after several more fields and several more gates (all thankfully waymarked now) we’re faced with a somewhat grotesque ruin. Moving round to look at it straight on we see that it is possible to walk right through to the other side. Being at the time more interested in external photographs I didn’t go inside and am now regretting it. Pevsner says that the tunnel-vaulted rooms are similar to those of Burneside Hall near Kendal – in which I have a particular interest because my 3xgreat-grandfather farmed there in the mid 19th century. Clearly another visit is called for. 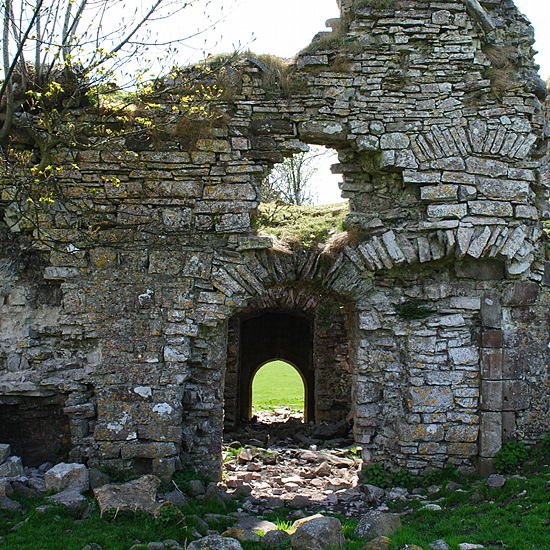 What is known about Lammerside Castle? Actually, very little seems to be known. It was for a time the seat of the Wharton family who in the 14th century built Wharton Hall, which we’d have reached if at Mire Close Bridge we’d turned right instead of left. The castle seems to have been a ruin for several hundred years. 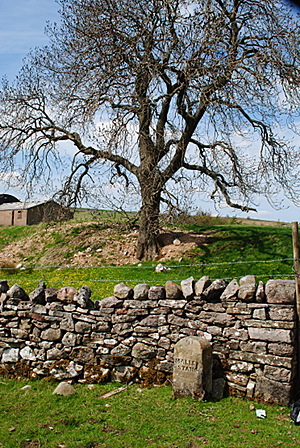 As at Warcop there appear to have have been comings and goings between the Warcop and Wharton families. Warcop Hall was at one time known as Wharton Hall, and Lammerside was in the early 15th century the home of Thomas de Warcop who was involved in the abduction and marriage of nine-year-old Margaret Sandford – all a matter of the inheritance of various Westmorland properties; the best account of this scandalous incident that I’m aware of is on the History of Parliament site. 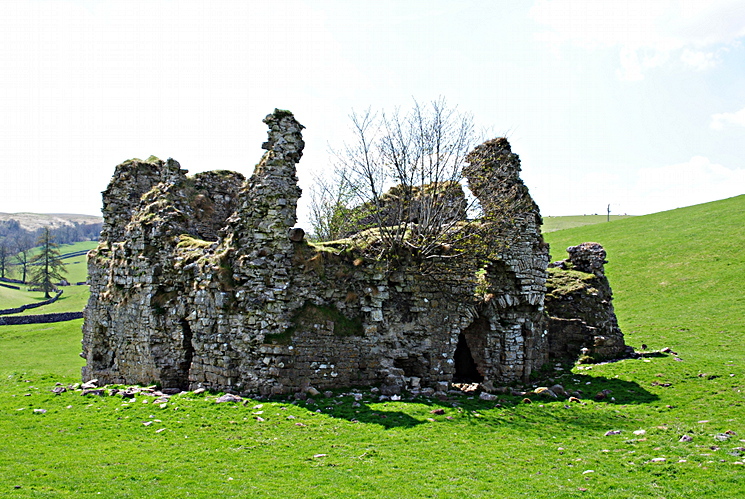 An interesting account of Lammerside Castle is given here, and aerial photography showing how extensive the building may once have been is found here.